Good morning peoples! How was the weekend? It was great here. Lots of lovely weather, all in the 80's, and seriously,I couldn't be happier. Oh wait, more 80's this week, I COULD!!!! Be happier that is, because I love cool weather. 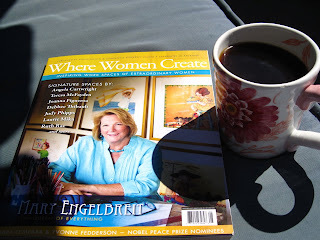 I spent some time out back on the swing with coffee and this magazine. It's a lovely read, especially when you know some of the people included! Joanna's studio is just as lovely as it appears in the magazine. I have also had the pleasure of meeting Debbee Thibault you might remember. I love her work. Also in this magazine is a feature on Nicol Sayre. I met Nicol at quilt market the first year I went. 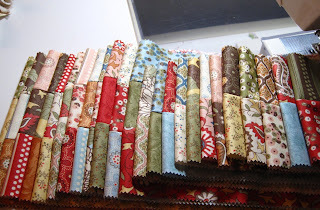 She and Dee Foust had a pattern company called Folk and Whimsy and I loved their designs. They are local girls and we saw quite a bit of their creative genius at Going to Pieces where I worked. Its lovely to see her studio featured. I did quite a bit of sewing over the weekend, and hoped to grab a nice fresh photo instead of these ... but with the lovely overcast gloom this morning, you'll have to settle for these. who? So excited to see your blog. I must get that magazine. A friend of mine is going to be in an upcoming issue. Her new studio is flat to die for! Have a super week, Pam. Oh the magazine.....I am just trying to convince myself that I should flip my small sewing room (9X10) poor light with the guest room (9x18) great light). We really don't have that many overnight guests, kids all married and most of them live nearby.It seems very indulgent but I am thinking more and more its the way to go! You're SO funny PKM. Temp is all relative -- 80's are WARM, 60's are cool. 100's are just ridiculous and mean you need to move someplace cooler. 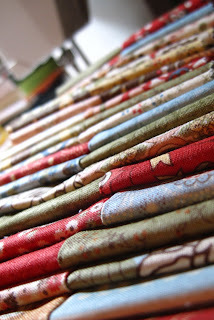 Yummy fabrics -- can't wait to see them done! I had a week of stay-cation and finished two quilts. I have so many pretty ones to do. Oh - I wish I were headed down your way, Pam - still in the 90's here! But at least you got to recover from your previous adventures in pretty good weather - what fun you all had! YOu need to come over to my blog to see what all I accomplished this weekend. In AL we had 90+ weather with thunder storms every afternoon. The 80s sound really good to me.